Hi, everyone. This is my first time posting here, although I’ve been crocheting like a mad-woman lately, trying to get things made for the holidays. I also have a traditional red stocking for the new baby in the family, as well as a hi-top shoes & “basketball” gift set. (I was going to put black lines on the ball so it’d look like a basketball, but they looked tacky, so I took them out.) 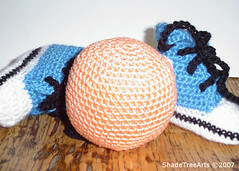 The patterns for the booties & ball came from past issues of Crochet Today magazine. 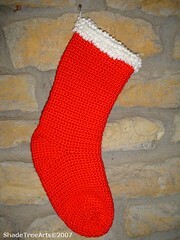 I’ll be crocheting at least two more stockings in the near future. I also have plans to make a sweater/coat, a adult afghan, and some baby items for the next new addition that will arrive in March, among a lot of other things. Those booties are just the rigth color! Very nice. Very cute. I love the basketball booties. I agree with the others – love those mini boots! The stockings are great too – I’m sure the kids will love them! those stockings are sweet! where did you find the pattern?